The title explains it all! I make these babies at least once a week! I am crazy addicte ! Lucky for me (and you now!) these are full of protein, low in fat, and free of salt, oil, and sugar. I have a secret to share with you; I made these for my full-blooded Italian mother-n-law and she did not even notice they were meat-less! She loved the flavor, texture, and taste. That’s when I knew these were a winner. If you are new to a plant based diet, I urge you to make this recipe. Give your body the opportunity to to have the greatest protection against disease by adding more unrefined vegetables and legumes into your diet. 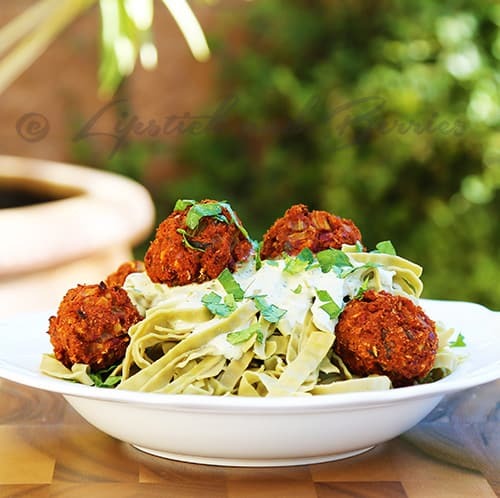 These meat-less meatballs make the transition to plant based diet even easier. Pictured here, I have the Meatballs placed atop Gluten-Free Mung Bean Fettuccine with Creamy Basil Sauce (I will post recipe soon!) , and sprinkled with fresh chopped parsley. Heat a few tablespoons of water over medium/high heat in a saucepan. Once water is hot add the Onion, Celery, and Garlic. Water sauté 5 minutes or until slightly translucent. Add Parsley, Basil, Italian Seasoning, and Sage. Stir and sauté another 3-5 minutes. Add more water if necessary to prevent sticking. In a mixing bowl, add Smashed Beans and all remaining ingredients and combine. Add sauté mixture to the bean mixture and combine. Line a baking pan with parchment paper, or lightly mist with cooking spray. Roll Meatless Ball mixture into 1 -2 inch balls and place on a parchment paper lined baking pan. 5 Quick Beauty Tips To Boost Your Mood! Looking forward to trying this recipe. The mung bean fettucine is fantastic just soaked in water for about 24 hours or to taste instead of cooking. Can’t wait to try it with these meatballs. Do you think you could use chickpea flour in place of the oat flour? Other than that, I wouldn’t have to make a trip to the grocery. Everything is on hand. Hi Shellie! I am so sorry, I don’t know how I overlooked this comment. I have not soaked the mung bean fettucine yet, but I will try it that way next time! I hope the chickpea flour worked out nicely for you. I am not very familiar with chickpea flour, but I am sure it would work just fine. Have a great day Shellie! It’s a must you try soaking these mung beans, and I make a cashew/tomato raw sauce for it as well sometimes.. It’s really wonderful, and it worked great with the balls.. As for the oats, I used my coffee grinder to grind up the steel cut oatmeal to make oat flour, and I had old package of instant that I used as well.. So I’m not sure about the chickpea flour. This recipe is absolutely declious, and is a keeper. Thanks so much..
Haha that’s awesome. Well, I am not the only who snacks on them then! The last time I made these, I had about 4 leftover. When I woke up for breakfast the next morning, I saw those 4 little balls staring at me in the refrigerator so I ate them right then dipped in marinara sauce! HAHA! Meatballs for breakfast! Shhhh! 🙂 Have a great day Shellie! This sounds so yummy Ashley!!! These sound FANTASTIC! Can’t wait to try! Just found your blog and I LOVE it! So inspiring…I am a fellow Las Vegan,hairdresser and plant based eater!